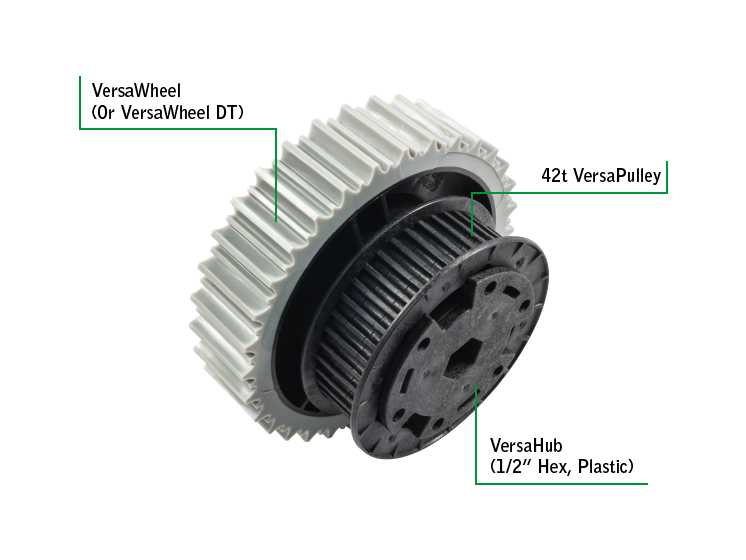 All VEXpro "Versa" products have the innovative VersaKey mounting system with holes that makes it easy to mount wheels to sprockets, gears, shafts, and bearings. The pattern pilots items together without relying on screws. 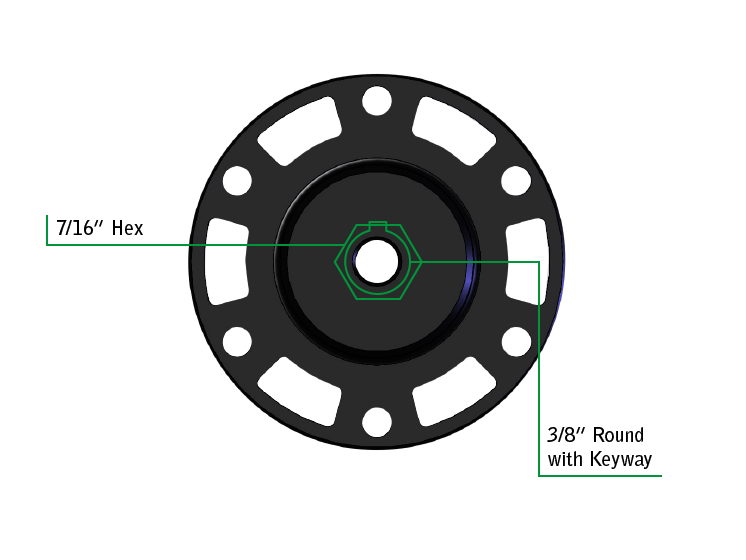 There are 6x 8-32 screws on a standard 1.875” bolt circle. There are 3x male and female keys on each side that transfer torque and pilot items together. 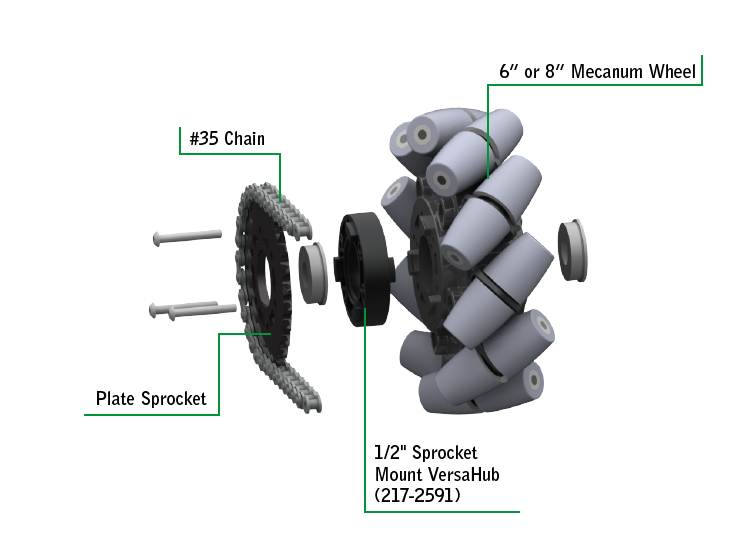 VEXpro 6" and 8" Mecanum Wheels include the VersaKey pattern and require a 1/2" Sprocket Mount VersaHub to achieve proper wheel clearance when driven with chain. 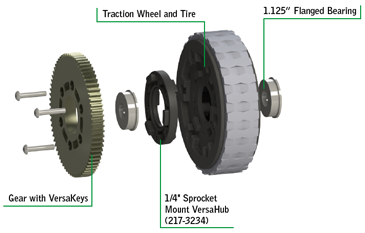 Traction Wheels have a recessed VersaKey pattern, requiring a 1/4" Sprocket Mount VersaHub to provide proper clearance for gears, sprockets, or VersaPulleys. 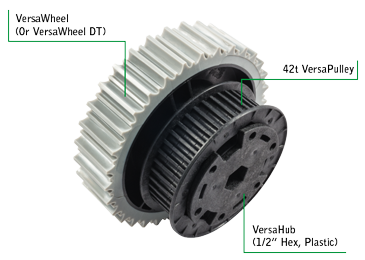 VersaWheels and VersaWheel DTs mount directly to VersaKey gears, sprockets, or VersaPulleys. 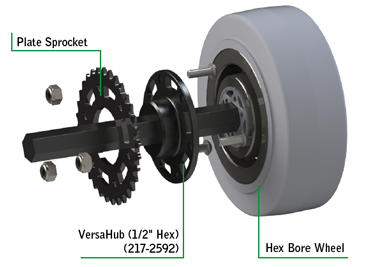 A VersaHub (1/2” Hex, Plastic) can be used to drive the assembly through a live axle. 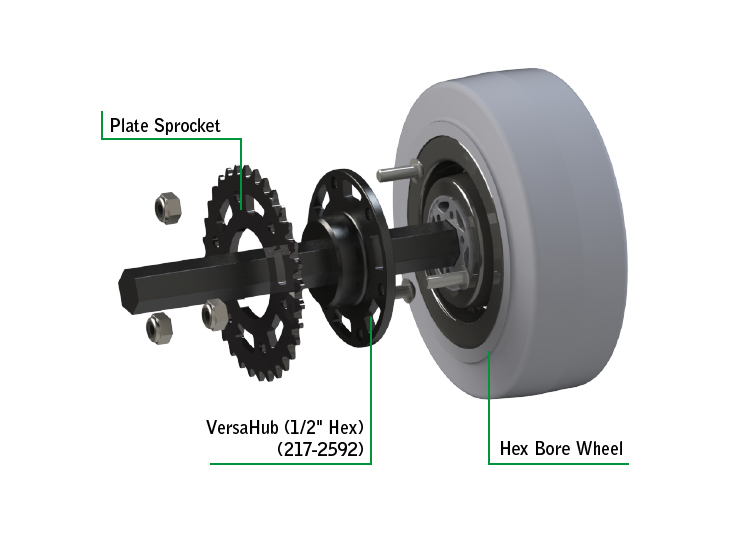 A 1/2" Hex VersaHub can be used to properly pilot between a wheel with a hex bore and a sprocket, gear, or other VersaKey interface. 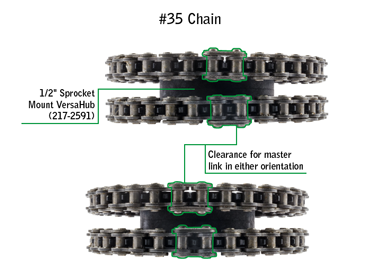 If chain is being run on two sprockets of the same shaft (such as you would find in the center shaft of a 6-wheel drive), care must be taken to ensure proper chain clearance. 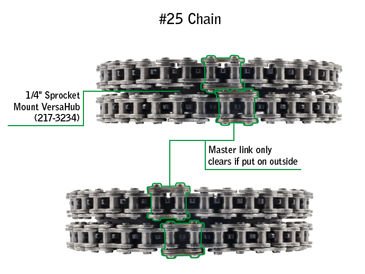 For #25 chain, a 1/4" Sprocket Mount VersaHub can be used to achieve a compact package if the two master links are mounted on the "outside" of the chain run. 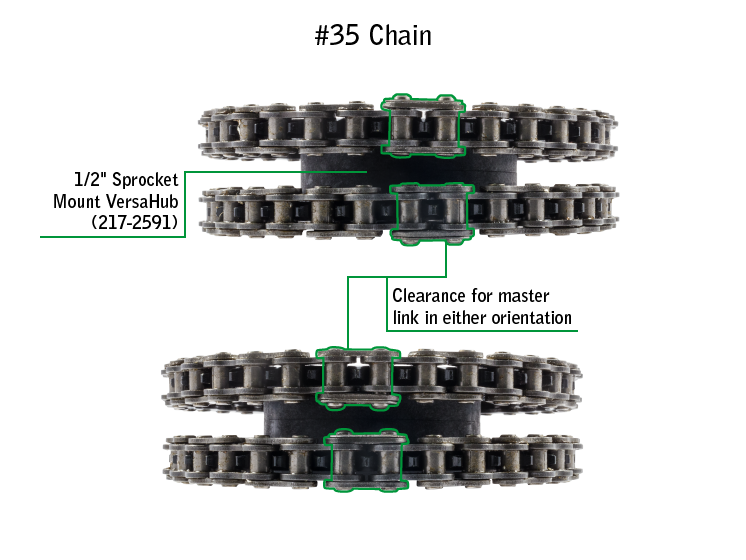 For #35 chain, a 1/2" Sprocket Mount VersaHub is an ideal solution regardless of master link orientation. 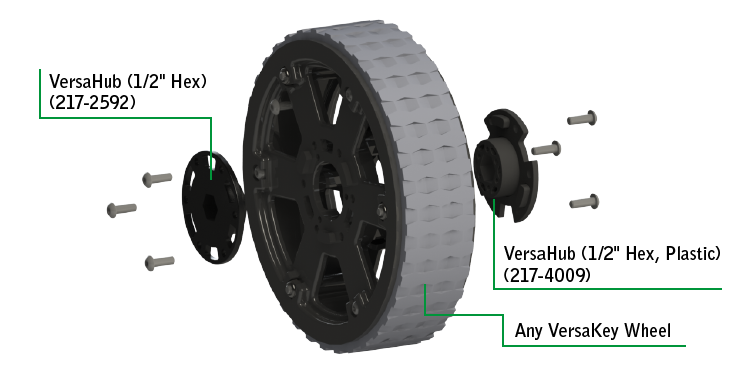 The best way to properly support and capture a wheel is with a VersaHub (1/2" Hex) on one side and a VersaHub (1/2" Hex, Plastic) on the other. 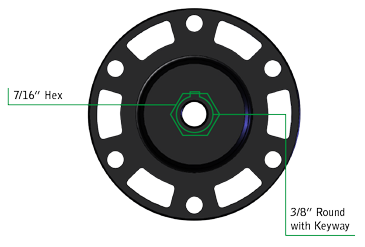 The aluminum hub handles torque transfer from the axle to the wheel, while the plastic hub on the other side supports the wheel without adding much weight. A standard (or ThunderHex) bearing can also be used in place of a plastic VersaHub. 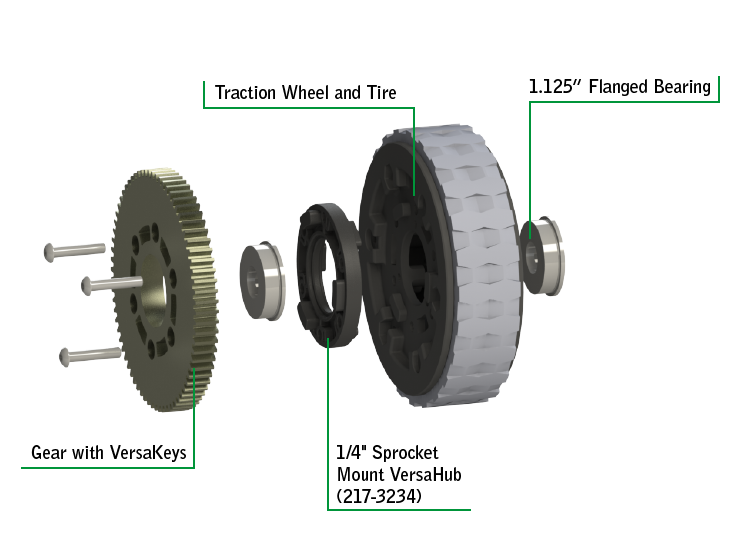 Since VersaKeys efficiently transfer torque while perfectly piloting gears or other hardware, VersaHubs can even be used to manipulate larger VersaFrame mechanisms. 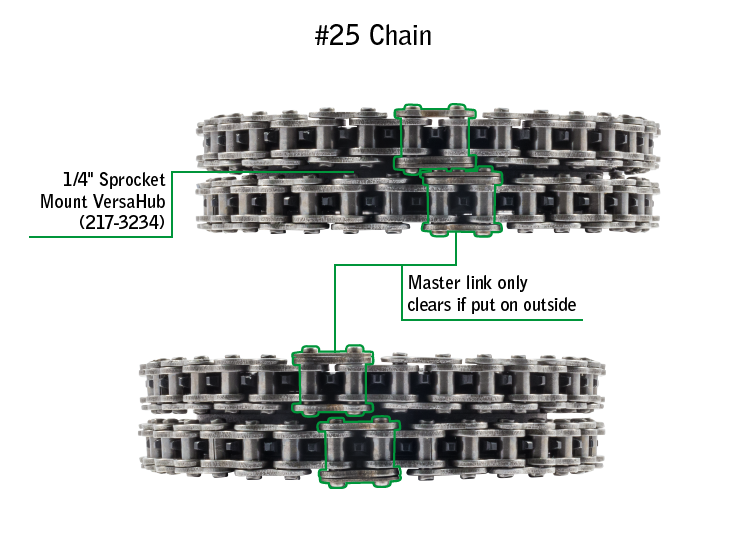 The VersaBlock includes a female VersaKey pattern which interfaces with driven rotary motion (such as a sprocket and chain) through a Sprocket Mount VersaHub. This technique was used in Team Copioli’s 2014 Build Blitz Robot and in the 2015 Build Blitz Simple Stacker. 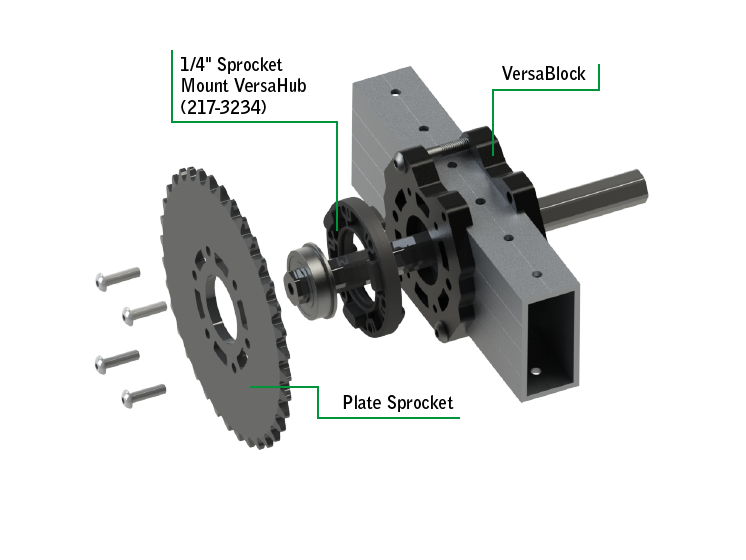 Since the 1/4" and 1/2" Sprocket Mount VersaHubs feature both male and female VersaKeys on all sides, they can be used as spacers or to create a rotating drum between two other VersaKey products. Team Copioli's 2014 Build Blitz robot utilized this feature on its intake roller. 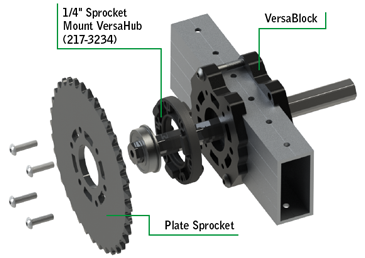 While 1/2" hex is quickly becoming a common standard in competition robotics, we understand that many teams still use other axle options such as keyed shaft or other hex sizes. 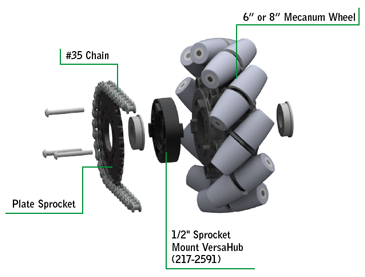 The 1/4” Round Bore VersaHub is designed with those teams in mind – simply broach, bore, or drill the center hole to your desired size and enjoy the advantages of the VersaKey system.